nd twelve people were killed. Two of them, a copy-editor and a policeman, had Muslim names. This morning (January 9, 2015) on The Current, a radio program of the Canadian Broadcasting Corporation (CBC), there was a debate among journalists about whether the cartoons that Charlie Hebdo published should be re-published in Canada. A Quebec journalist argued that every media outlet in North America should publish them. The spokesperson from the CBC argued that the CBC hadn’t published the cartoons before the attack, so why should it publish them afterwards. That’s like saying that if the CBC hadn’t published a picture of a Canadian before she was murdered, why it should publish the picture afterwards? It seems that some journalists are frightened to publish these cartoons and are trying to find rationales for not doing so within the framework of journalistic ethics and responsibility to viewers or readers. It was particularly ridiculous this morning to listen to a trio of (presumably) non-Muslim Canadians argue about what “moderate” Muslim Canadians might find offensive. Personally, I find the term “moderate Muslim” itself offensive. It implies that my fellow citizens who are Muslims must constantly defend themselves against the charge that they might be religious fanatics. Canadian Christians don’t have to go around all the time saying, “I’m Christian, but I’m not a fanatic” as if they were all members of extremist white, self-styled Christian groups unless proved otherwise. I asked myself if I would be willing to publish Charlie Hebdo cartoons. There isn’t a complete set of particular cartoons, as there was during the 2006 “Danish cartoon” controversy; Charlie Hebdo was targeted because of its supposed irreverence to Islam over the years. I found a set of their cartoons, with translation and explanations, here. 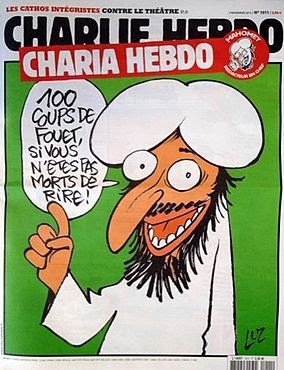 http://www.vox.com/2015/1/7/7507883/charlie-hebdo-explained-covers. Some of the cartoons are about Islam but others are about Christianity or politics. As the authors of the piece explain, Charlie Hebdo was (is?) a journal that resolutely defended French secularism and liked to mock all kinds of pretentious authority. I particularly liked the cartoon of Mohamed returning to earth and being beheaded by an Islamic State-type fanatic, even though he identifies himself. Mark Goodale, ed. 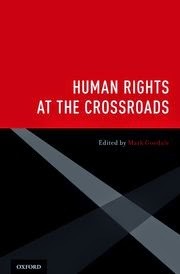 Human Rights at the Crossroads, Oxford University Press, 2013). Yet dictatorial, authoritarian or totalitarian governments all impose controls on freedom of speech, from North Korea to China to Russia to Iran to numerous African dictatorships. Some people might argue that you can live comfortable lives without this right, as in China. But in China today, even as the rich get richer the poor are left behind, rural to urban migrants are treated as if they do not exist, the state or its corporate cronies can expropriate your property and force you out of your home--- and the list goes on. And those who criticize these policies are jailed or tortured or forced into exile. Now we have a new kind of non-state censorship. Fanatical Muslim extremists are trying to stop all portrayals of Islam that they consider offensive. Some well-meaning non-Muslim Westerners, like the journalist I heard today, seem to assume that these fanatics also represent the views of “moderate” Muslims, whom non-Muslims should not “offend” by publishing cartoons about Islam, or Mohammad, or the burqa. Muslim Westerners, it seems, are very thin-skinned, lack a sense of humor, and are incapable of exercising their religion if their fellow citizens publish cartoons about Islam. I don’t think this is the case. Most of the Muslims I know in Canada are as attached as I am to freedom of speech. If we only have one human right, it should be freedom of speech. From freedom of speech flows freedom of the press and freedom of association. These rights make it possible to criticize governments, which in turn sometimes persuades them (in democracies, at least) to change their policies. Just as we can criticize governments, so we should be able to criticize religions. Without freedom of speech and the press, for example, the Roman Catholic Church would probably still be burying its head in the sand about widespread abuse of children by priests. I know a lot of practicing Catholics (family and friends) and I’ve yet to hear one claim to be “offended” by such criticism of their church. I am exercising my right to freedom of speech as I write this blog. I don’t know how much courage I have (not very much, I suspect); certainly, I don’t have as much courage as all the journalists and cartoonists who wrote and drew for Charlie Hebdo. They are martyrs to a centuries-long battle for freedom.